The Aspen Institute’s influential report, Rising to the Challenge: Re-Envisioning Public Libraries, predicts that in the coming years, the most successful public libraries will be the ones with services that prioritize and support local community goals. "What libraries need is to be more intentional in the ways that they deploy resources in the community, and more deeply embedded in addressing the critical challenges facing the community. This will require a level of flexibility and adaptability to change as community needs change." So how is the Free Library of Philadelphia rising to the challenge? Starting in October 2018, 300 staff members at all levels will have the chance to learn and practice the skills necessary to thrive as the role of libraries evolves. This professional development initiative is funded by an Institute of Museum and Library Services Laura Bush 21st Century Librarian grant. 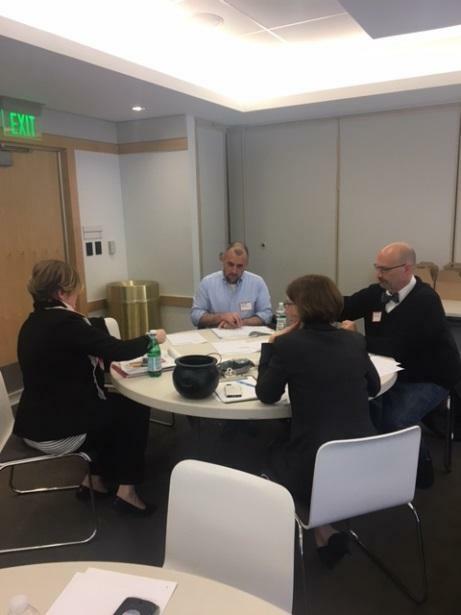 On March 19, 2018, eight experts from the United States and Canada gathered at Parkway Central Library to work with Free Library staff and consultants who are developing and evaluating the training curriculum. We spent a day reflecting on the essential skills for leadership, community engagement, and program development. The National Advisory Committee members enjoyed the day of conversation and are looking forward to piloting the curriculum in their locations: San Francisco, CA; Hartford, CT; Halifax, NS; Cleveland, OH; Multnomah Country, OR; Shippensburg, PA; and Columbus, WI. All Free Library of Philadelphia public service Administrative Librarian 1s, Regional Librarians, Library Supervisor 1s and 2s, Library Coordinators, Librarian 1s and 2s, Community Organizers, and Community Initiative Specialists will attend one of the twelve training cohorts starting in October and staggered across the next two years. Administrative Librarian 2s, Municipal Guards, Library Assistant 1s, 2s, and 3s, Clerk 1s and 2s, Digital Resource Specialists and Curators will be invited to participate as well. After attending four three-hour workshops, participants will tackle hands-on projects designed to practice their new skills, such as researching neighborhood assets, facilitating community meetings, and contributing to the Free Library’s existing community engagement initiatives. Lynn Williamson, Chief of the Neighborhood Library Services Division, is the Project Director and Cameron Voss is the Project Coordinator for the Skills for Community-Centered Libraries Initiative. I read the above with great interest as I am a resident of Shippensburg, Pa. which is helping to pilot this program due the efforts and of Jody Cole our Library director. It is quite an honor to be included in this vital study of how libraries can best serve communities in the future. Thanks for your interest in the Community-Centered Libraries trainings. We are excited to be collaborating with Jody to pilot the workshops in Shippensburg in September 2019.